Unibet, one of Europe’s largest online gambling operators has recently acquired the online gambling section of Stan James which is a well-known British gambling business. The Stan James Group has been active in the United Kingdom for many years and along with actual betting shops it has an online presence offering casino games, sports betting and poker. Unibet is reported to have agreed to pay 19 million pounds sterling for Stan James’ online gambling business. The sale has to be approved by the regulation authorities in the United Kingdom so it will be the autumn before the sale would be complete. Unibet is listed on the Swedish Stock Exchange; The company was founded in 1997 and it operates in more than a hundred different countries. Unibet’s Chief Executive Officer, Henrik Tjarnström and the Chief Executive Officer of Stan James, Dennis Kelly have both mentioned the fact that the combined strengths of both companies will enable the business to expand and increase its market share in the United Kingdom’s regulated online gambling sector. 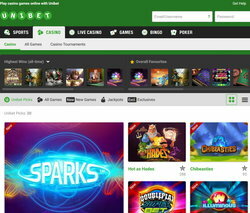 The CEO of Unibet has said that the company recognises the potential to further develop Stan James’ online offering of live streaming and online casino gambling along with improvements to the mobile sector. Unibet has been looking to increase its share of the United Kingdom’s online gambling market for some time so with the acquisition of Stan James’ online casino and sports betting business it can finally do this. The United Kingdom’s online gambling market is believed to be worth about 2.7 billion pounds this year. Stan James represents a good opportunity for Unibet to expand within a regulated market and even with the imposition of the United Kingdom’s point of consumption tax Stan James’ position is strong so far in 2015. It had been feared in the online gambling industry that the British government’s introduction of the point of consumption tax would have a detrimental effect on investment in the online casino sector. The tax is payable on online gambling transactions no matter where the player is physically present. Unibet Casino offers players a wide range of over 350 games from several games developers including Microgaming, IGT and Evolution Gaming. There are classic casino games such as roulette, blackjack, baccarat and poker and also well over 250 slot machines. 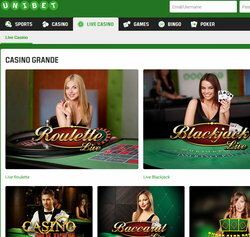 Unibet offers players in its Live Casino a choice of two live dealer platforms. In the Live Casino Grande Unibet has live roulette, baccarat, blackjack and poker tables that are streamed live from Evolution Gaming’s casino studio in Lithuania. Players can access Live Casino royale on a mobile, iPad and PC. The Live Casino Royale offering live dealer roulette and blackjack comes from the NetEnt casino studio in Malta and it is only available on a PC.